Yves "Jetman" Rossy's exploits have been well-documented over the years. He's crossed the English Channel, the Grand Canyon, and flown alongside a B-17 bomber with a jet-powered wing strapped to his back and nothing else. He's crazy in the best way possible. We caught up with Yves yesterday to chat about what's coming next for Jetman, his thoughts on Felix Baumgartner and what it's like to fly with a wing strapped to your back. Gizmodo: Since your first flight in 2006, what changes have you made to the wing and what version are you currently flying? 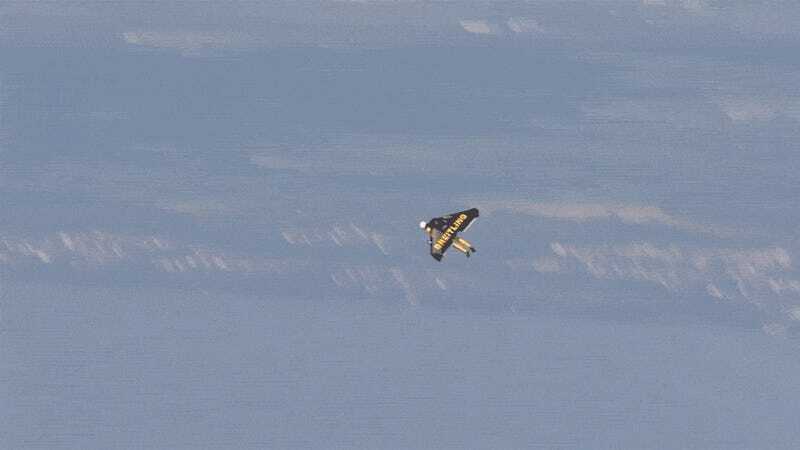 Jetman: 2006 was a rigid wing, but foldable, and only 2 engines. So I was just able to fly level, sustained flight. After this, I have a wing that is much more simple, smaller, more compact, so it’s lighter because I don’t have all the system of the foldable thing. And I have 4 engines. So these are the main differences. And it’s a more delta wing, I have bigger winglets, another profile that is much more stable than the first one, because the first one was made first, to match an inflatable structure, not a rigid one, so it was thicker than that one. So it didn’t fly so well as that one. This one is a result of an aerodynamic study in a wind tunnel. The former one was the result of a good feeling. Gizmodo: Are you going in the wind tunnel when you’re testing the wings, or no? Jetman: That’s the only time that I went in a wind tunnel, with the wing that I crossed the Channel with. We don’t have any database of a flexible structure, of the human physiology, so it’s impossible to simulate that, so if I wanted to increase the performance, you should first know what you have. So I went into the wind tunnel and we measure everything, without moving the wing, but just moving my body, making the moves that I do in the air to steer, to fly, and we did measure everything. The result was that I was unstable in roll, unstable in yaw, and just stable in pitch. So the engineers from the wind tunnel they told me, this thing shouldn’t fly. But I am an adaptive structure, and that’s why I did fly. As it was quite unstable thing, with the engineers we did develop something that is more stable, less complicated without the foldable wing, and yeah, that’s the result. And the study was made in 2008 and the first prototype, first as a glider, I did fly it in 2009 only. So it’s quite recently. Gizmodo: Prior to a flight, what’s your training regimen like? Jetman: Okay, so I try to keep fit, the landing gear are my legs so I train my legs by jogging, swimming, biking and skiing. I try to do activities where I need also some, like skiing, it’s not just lifting weights, you adapt to the snow, to the elements, to the environment so this kind of training. And just before flight I do a good warm up of everything – legs, arms, back, neck, you know? So that I’m really ready for action and also as I have still, especially at the landing I still have 80 pounds, 75-80 pounds on my back, if something happens I’m warm and it’s not a big shock for my physical, for my legs and bones. Gizmodo: So the whole system is 75-80 pounds? Jetman: Yes, at landing. And when I go in the air I’m about 130-135 at the beginning. The difference is the fuel and smoke liquid. The smoke is paraffin, a mix of paraffin and diesel, and it goes in the exhaust of the engine, it is about 700 degrees, it makes a nice white smoke. Gizmodo: Do you still fly conventional planes? Jetman: Yes, especially biplanes. I regularly fly a Vickers. That’s a real, small biplane, you do aerobatics, and so it’s really nice also to have your head outside, you know, it’s not inside a bubble, inside a cockpit. You have a much better feeling, you know, if it’s cold if it’s warm, also the smell of the trees when you’re at low altitude and so on. Gizmodo: Is there a particular era of planes that you enjoy? Like, I like old WWII bomber planes. Jetman: I love WWII airplanes too, but my heart, I’m not objective, I was a fighter pilot, and I’m still flying a Hawker Hunter. And in these kind of machines where you’re just, a Mirage you’re twice supersonic but a Hunter is just subsonic. When you’re at that speed, like, 1,000km/h low altitude in the Alps, and that energy, with that reference of the mountains, it’s completely unreal power. These are really great feelings because that third dimension, in a few seconds you go from the bottom to the top of the Matterhorn, that’s a big, big rock, that’s only a few seconds. I went twice on the top of the Matterhorn, it’s 7 to 8 hours climbing, and you have to descend. In a few seconds you are on top with one of these airplanes. When you have this feeling you know, the energy you have is completely unreal and it’s good. It gives you really a dimension more, it’s not anymore flat. That’s fantastic and uh, I love the jet fighters. 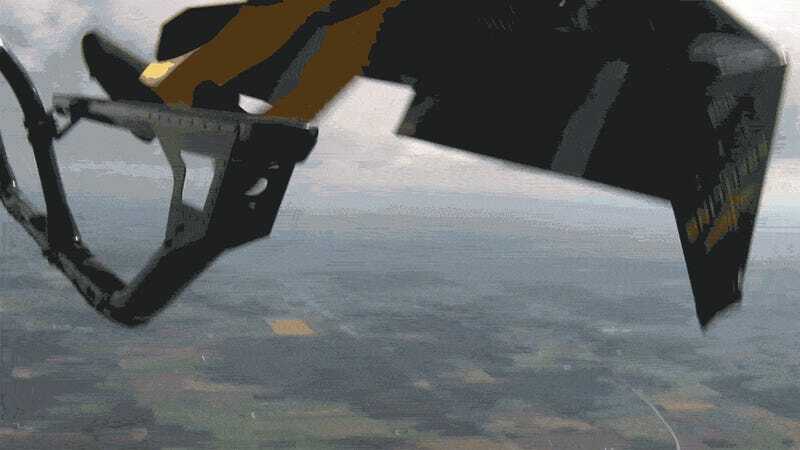 Gizmodo: In the time you’ve been using the wing, is there a particular instance that was your scariest moment? Jetman: Yeah, I had scary moments [early on] when it didn’t work so properly, at landings, under my parachutes, bad winds, almost crash landing. I could have been in a wheelchair after landing like that, just luck, I had a good guardian angel. I had also close calls when I was so confident, then I was again in a bad situation, you know, it was unstable, or spins, and I had to release the wings about 20 times during the development. It's especially worse when you aren’t very confident. You think, "oops I’m unstable," and I have you know an audible altimeter saying to me you are at a minimum altitude, "beep beep beep beep," like that I’m going down, okay I’m unstable, I cannot open my parachute, I release the wings. Okay, it works. But when you are becoming confident, and in the air, now I manage the thing, and you have again something like that, unstable or something, and you hear “beep beep beep beep” you think yeah, I will, instead, you know, release the wing and normally you have small repairs and it’s complicated, and sometimes it could break a part, so you think, yea, okay, I’ll go a little bit further and I’ll regain control. And if you don’t regain control, and then you are too low to do anything else but open your parachute in a completely unstable situation, which is extremely dangerous. Because if you open your parachute when you are like that, the risk that your lines are going in your feet or around you or around your neck is very high. And it happened once, luckily I’m still here, but yeah, these kinds of situations, I didn’t have many but I had to do breaks, to calm down again, and then passion comes again. Gizmodo: How fast can you currently go with the setup that you have right now? Jetman: Cruising is like hundred knots, that’s, in miles per hour, 110, 120 miles per hour. And maximum 190 before, in descent, full thrust, before a loop I am about 190 miles per hour. I don’t have any speed measurement except my good feeling, but we did put some measurement sometimes to know G’s, I pull up to 3-Gs, with a mini-platform inside the wings, that’s why I know which kind of speed I have, but, you feel everything you don’t need instruments. You put your hand out of your car window, you can close your eyes, you can say anytime if you are slow or fast, just with the pressure of the air. And I am in the air so I don’t need instruments. Gizmodo: And how high can you go? 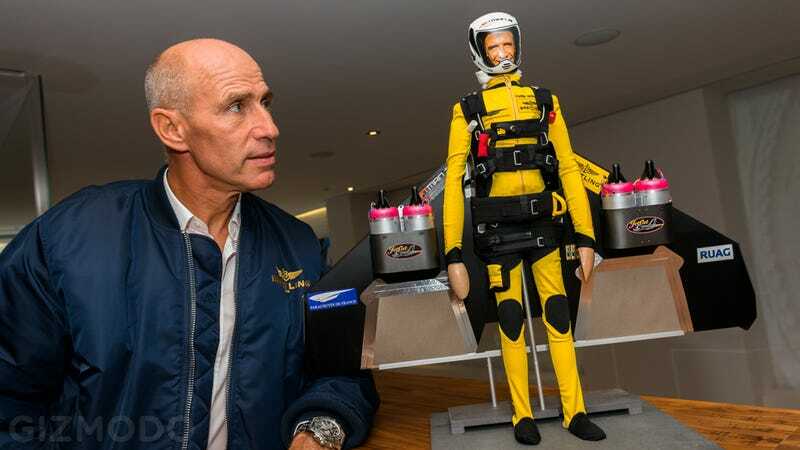 Jetman: The highest I’ve been now is about 13,000 feet, so a little bit more than 4,000 meters. But, ok, most probably I could go higher I didn’t try yet, it’s really and that’s the record with that kind of wing. That’s the next step I’m waiting on bigger engines that will give me, really, normally I hope that it will work, a sustained vertical flight, up, and at that time I would like to go up as high as possible, theoretically to the stratosphere. But it’s only theory, so we’ll see if in practice, in reality it’s possible. But I don’t risk anything to try because I have 2 parachutes on my back, I’ll have oxygen, and even without any engines, I glide, so go up until no fuel, PEW, and then look at your altimeter. That’s one of the next projects. Gizmodo: So that’s the next project? Jetman: ONE of the next, there are many. Gizmodo: What are some of the other ones? Jetman: Starting from the ground, but not flat ground, a cliff. Why a cliff, because it’s safe, you know, you can imagine if this is the cliff, you go out with, 80 miles per hour out of the cliff here, you accelerate on the ramp, so if it flies, no problem. If you have a problem, release the wings, open the parachute, you are high enough. Cause that’s a moment that is fantastic, I don’t know if you’ve tried a paraglider or hang glider, when you leave the ground, you know, you run and suddenly you feel that you are leaving earth. And that’s a magic moment, completely unnatural for human. And I would like to feel that with my wings on my back. Jetman: And down? You come down anyhow. Gizmodo: So how would you come down with your jetpack? Would you have to release it? Jetman: Nothing, it glides without any engines very well. So yes, that’s a nice challenge, go to the stratosphere, but not down, up? It will be difficult to go as high as he was because even missiles don’t go that high, but I’m not a missile. But yeah, as high as possible, direction stratosphere. Gizmodo: Did you watch his jump? Jetman: Yeah, fantastic. You know, old skydivers are jealous because yeah, that’s a fantastic step. From that height? Not easy, but, I think, yeah, we are jealous of this guy.